My hubster, Anthony, and I recently visited New York Citywhere we met Liza and her family. They opened their home to us and Liza served the most delicious brownies. She said they were really easy and generously gave me the recipe. Liza’s original recipe called for a doctored-up brownie mix. I decided to use her fancy extras for a batch of brownies made from scratch. 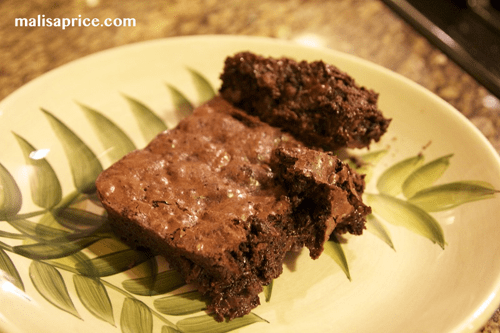 It took me four tries to perfect the brownies (hopefully our waistlines won’t suffer)! They really are easy once you have a recipe to follow. Preheat oven to 350 degrees. 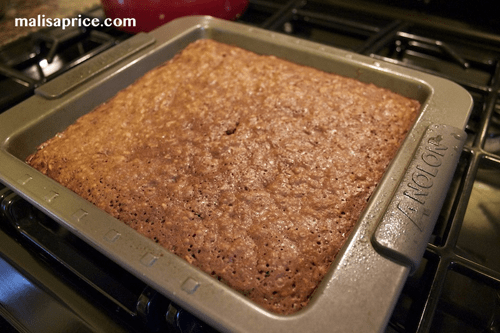 Grease an 8 x 8 baking pan with cooking spray. You’ll also need a 9 x 13 pan for a water bath. Combine the butter, cocoa, sugar, and salt in a heat proof bowl or double-boiler pan. Melt over simmering hot water, stirring occasionally. Be careful not to let the water boil or the chocolate might burn. When the butter is melted and the chocolate is smooth, remove from heat. Set aside to cool for 5 minutes. If you used a double-boiler, pour the mixture into a large mixing bowl. Using a wooden spoon, add the vanilla extract to the chocolate mixture. Add the eggs, one at a time, stirring in between each addition. Once the batter is shiny, add the flour and mix just until combined. Stir the entire mixture for about a minute with the wooden spoon. Add the chocolate chips and pecans. Pour the mixture into the 8 x 8 pan. Place the 8 x 8 pan in the 9 x 13 pan. Add hot water to the larger pan, enough that it covers most of the smaller pan. Be very careful transferring the pans to and from the oven. Bake for 50 minutes, until a toothpick inserted comes out clean. Remove the brownie pan from the water bath and set on a wire rack to cool. The top of the brownies will be crisp and the inside will be moist. A perfect combination. Liza recommends freezing the brownies and serving with ice cream. We prefer to eat them right out of the pan. What’s your favorite way to doctor up brownies? Do you start from a box mix or from scratch? Malisa blogs about her experiences as a married woman and a follower of Christ in the 21st Century at MalisaPrice.com, where she hopes to encourage and entertain her readers. Her favorite things include cooking and baking, although I modify almost every recipe to make it more healthy and tasty, and she’s also a craft enthusiast.